As the county town of Bedfordshire, Bedford is filled with history, culture and character. St Paul's Church, Guru Nanak Gurdwara Temple and Bedford Castle Mound are just some of the fascinating sights to be found in the centre. Gardens help add to the city's character, with those that line the Great River Ouse particularly beautiful. At Ricky Tyler Landscapes, we're passionate about gardening, so we offer our grounds maintenance services throughout Bedfordshire to help both business owners and homeowners keep their gardens looking at their best. We're also happy to serve towns and villages in the surrounding area, such as Kempston, Bridge End, Renhold and Cople. 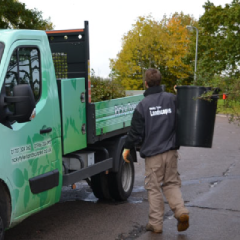 If you're a business owner or manager in Bedford, our commercial grounds maintenance services could be just what you're looking for. By taking the task of garden upkeep out of your hands, our expert gardeners can free up some of your time while simultaneously improving the image that your business projects. With a perfectly manicured lawn, pristine hedges, litter-free grounds and weed-free flowerbeds, visitors will trust in the professionalism of your company, whatever industry you're in. You can trust in Ricky Tyler Landscapes to deliver the commercial landscaping services you need; we offer on-site consultations to ensure no stone is left unturned when it comes to keeping your grounds looking fantastic. If you have domestic gardening needs, never fear - we can help with those too. We will come to your home - whether it's located in Bedford, Willington, Clapham or elsewhere in the county - at a time that suits you, and on a weekly, fortnightly, monthly or one-off basis. Homeowners who aren't in great health or have full-time jobs find our garden maintenance services particularly helpful, lifting the time-consuming and tiresome task of regular upkeep off their shoulders. We can keep your lawn looking tidy and healthy, your flowerbeds weed-free, and your hedges well maintained. Whatever you need, whether it's simple lawn care and turfing or something special, Ricky Tyler Landscapes has the solution. 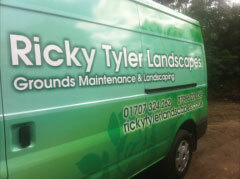 Ricky Tyler Landscapes can provide gardening and grounds maintenance services including Bedford Grounds Maintenance covering Bedford, Bedfordshire .